Home Windward Islands	Turtles At Last! Well, at last we’ve swam with turtles! It’s been on my to-do list since we saw a little turtle’s head briefly break the water’s surface in Martinique, so I can finally tick that off. 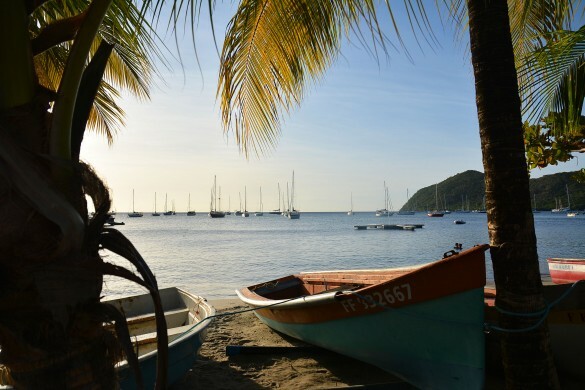 We spent a total of 5 days in Bequia in the end, and we’re glad we did. 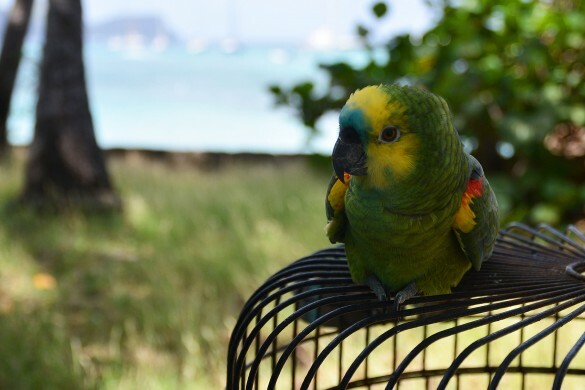 I really liked Bequia. 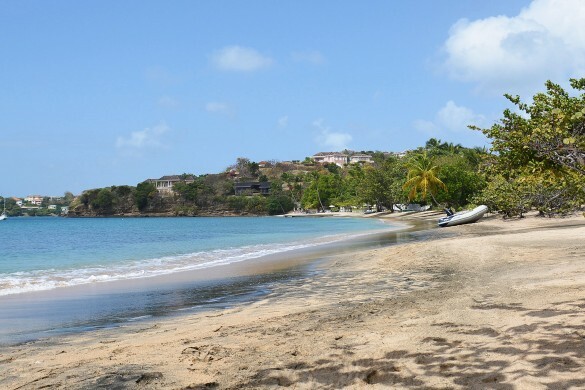 It has a perfect blend of plenty of things to do- beautiful beaches, bars, restaurants, shopping- coupled with a slow pace of life and a chilled out vibe. We spent a lot of time snorkelling, swimming and eating out, as- somehow- about six ARC boats convened in Admiralty Bay during the week, and we had some serious catching up to do! Nick continued to woo Sandra and John with his skills in the galley. We offered to cook for them one night and managed to intercept a dinghy that was selling lobsters. “How much?” Nick called as they passed, holding a poor lobster up for display. It waved its claws feebly. We grinned at the implication that perhaps we couldn’t afford that extra 5 EC (£1.25) a pound, but were happy with the transaction. Clearly having a smaller boat does occasionally have some perks! Nick bunged the lobster in the pressure cooker and then turned the cooked meat through a lightly spiced coconut and dill sauce. I swear, it was one of the best meals I’ve ever had. Ever. John and Sandra couldn’t stop talking about it for days. 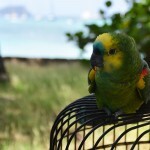 We left Bequia for the Tobago Cays because everyone said, “Oh, you MUST go! !” Nick had been before, in the low season. He was not happy when the anchorage that he’d been in last time was suddenly teeming with charter yachts. We anchored and then dinghied across to the turtle watching area. Nick glared at all the charterers. “Yes, but it’s- OH MY GOD I JUST SAW A TURTLE!! !” And with that, I literally jumped into the water and swam over to the spot I had seen it’s head poke curiously out of the water. I don’t know what I planned to do when I got there- cuddle it perhaps? But, alarmed, it swam away. Not to worry, we went to the protected turtle watching area and soon found several more. Nick and I took turns diving down to get a closer look, but were careful not to frighten them by getting too close. They looked pretty serene to me anyway and are probably used to tourists gawking at them. God, do I really look like that?! Anchoring in the Tobago Cays. Such concentration! The next morning we left. I’m not going to lie. I was disappointed by the Tobago Cays. I’d love to come back out of season when there aren’t so many charterers and enjoy the peaceful surroundings. But it was not very pleasant being crammed into the anchorages (not small anchorages either!) like sardines. We motored over to Union Island to clear out of the Grenadines. Tobago Cays. No boats in this picture! 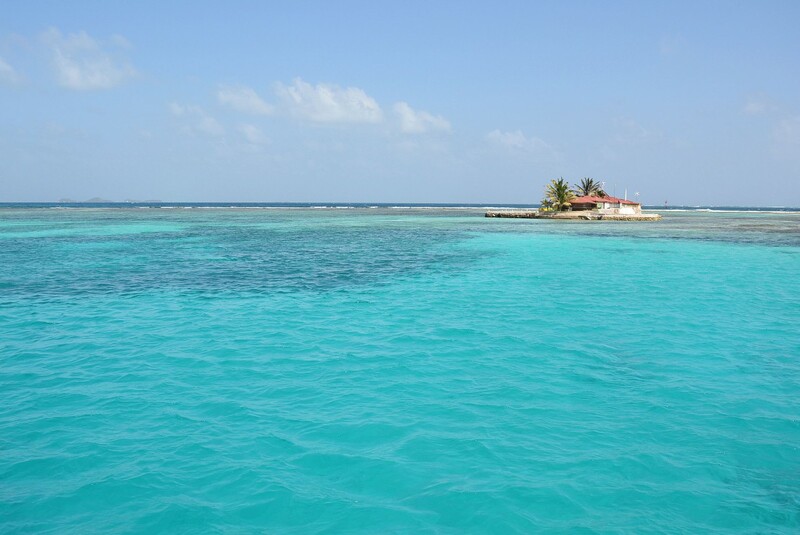 The anchorage at Clifton in Union Island is protected by a reef, but otherwise completely open to the easterly winds. We didn’t have a choice, though- we were here to check out. 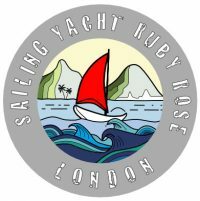 After going aground on the reef- yes, it was embarrassing, let’s move swiftly on, shall we?- we then anchored on our second attempt out near Happy Island. We were too close to another boat, but luckily they cleared off within an hour, so we let out a bit more chain and relaxed. The next morning it was Monday, so we could clear out without being charged weekend rates. Nick went in first thing, but ended up having to go to the airport because no-one was in the office. It was only a five minute walk away, so hardly an issue. He returned by 9:30 and we were off! Happy Island, Union Island! It’s a bar and an island all in one- sadly closed the day we were there. Now, the sailing thus far hasn’t been brilliant. 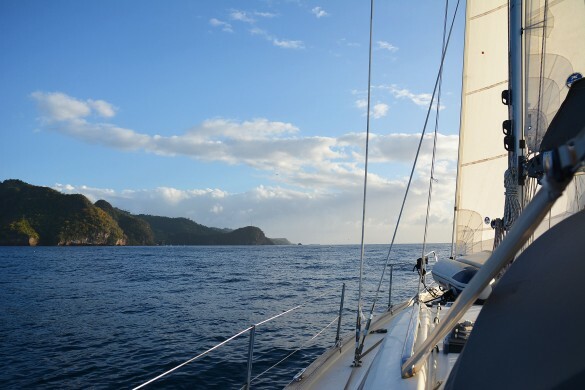 The sail to Bequia from St Lucia was challenging due to the variable conditions the whole way down, and between Bequia and the Tobago Cays it was pretty windy and choppy. However! The 45 mile sail between Union Island and Grenada was, I have to say, absolutely cracking. We had a consistent 15-18 knots on the quarter, and made an average of 6.5 knots. The boat was wonderfully stable, the sun was out, the scenery was pleasant- what more could one ask for!? Nick got so excited that he even unearthed our magnetic chess board, and we had a game off the Grenadan coast. He won, but I swear it was close! We came into Prickly Bay about 5pm and found a spot in the anchorage. 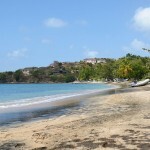 It is a lovely and very well protected hilly bay with lots of impressive houses dotted around the place. Nick radioed the marina and asked if customs were still open. “They were meant to leave an hour ago, but they’re still here…” Nick and I were momentarily confused by this, but when Nick went ashore with the paperwork, it all became clear. They were in the bar, enjoying happy hour! Nick dragged them away from their half priced beers and got us cleared in, and now we’re planning to spend the next few days in this location in order to change the boat batteries and do some general maintenance. What a great adventure enjoy.